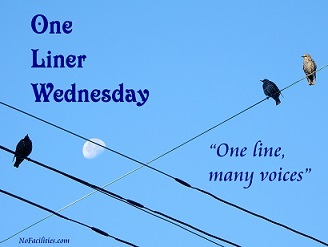 Categories: Blogging, Blogs, Funny, Life, One-Liner Wednesday, Prompt | Tags: #1linerWeds, fun, Humor, humour, inspiration, lyrics, magnetic fridge letters, writing prompt | Permalink. 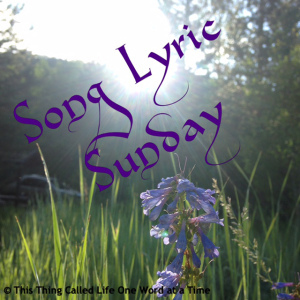 For this week’s Song Lyric Sunday (brought to you by the lovely and talented Helen Espinosa – click to see the prompt!) we were tasked with coming up with a song from the 90s. I listened to the radio a lot back then, driving back and forth to my job in Ottawa, but there aren’t too many songs that stuck with me. This was one of the few. Anyway, here’s an awesome live performance with an entire orchestra. Categories: Blogging, Blogs, Song Lyric Sunday | Tags: Alanis Morrisette, City of Angels, inspiration, lyrics, music, prompt, soundtrack, uninvited, WordPress, writing prompt | Permalink. The wonderful Helen Espinosa has, this week, declared Song-Lyric Sunday’s theme to be a song that we love from a movie. (Please join in – it’s fun!) It was a tough decision, but finally I chose a song from the movie, Babe. It’s sung by Farmer Hoggett, played by the lovely James Cromwell, during the film and by the Field Mice in the end credits. The song has quite a history. “If I Had Words” was first recorded in 1978, sung by Scott Fitzgerald as a duet with Yvonne Keeley. It became a hit in the UK. I imagine Scott Fitzgerald gave it lyrics, but I haven’t been able to confirm it. Considering the lyrics themselves, this is strangely ironic. The music was adapted from Symphony No. 3 by Camille Saint-Saëns, written in 1886. The lyrics are simple but deeply profound to me, as a writer. They represent everything I would give to my children, every day of their lives, if I could. The music moves me as much as the words, so I’ll leave you with two sources. First the version from the movie, and second, the Symphony. The latter is 36+ minutes long, but the section in question, if you want to hear just that, begins shortly after 27:20 in the Youtube video. The whole Symphony is beautiful. Oh, and what the hell: I’ll add the Mice version too, since it’s so cute. Categories: Blogging, Song Lyric Sunday | Tags: Babe, Camille Saint-Saens, children, fun, inspiration, James Cromwell, lyrics, music, Symphony, WordPress, writing prompt | Permalink. Categories: Blogging, Blogs, Cool Stuff, Opinion, Song Lyric Sunday | Tags: family, Fastball, life, lyrics, mother's day, music, parenting, prompt, The Way, WordPress, writing prompt | Permalink.